While it is tempting to jump into a deep dive straight away, oftentimes it is useful to do a scan of the waters to determine the most fruitful region for investigation. For these sorts of purposes, Macro Man generally finds it helpful to look at broad-stroke indicators to identify areas and regions of potential interest. Given that it's been some time since he's done any sort of screening on growth momentum, that seems like an appropriate place to start. While relative growth trajectories are obviously pretty static in the short run, sometimes it's easy to fall into the trap of erring too far on the side of stripping out the noise by not checking in often enough. 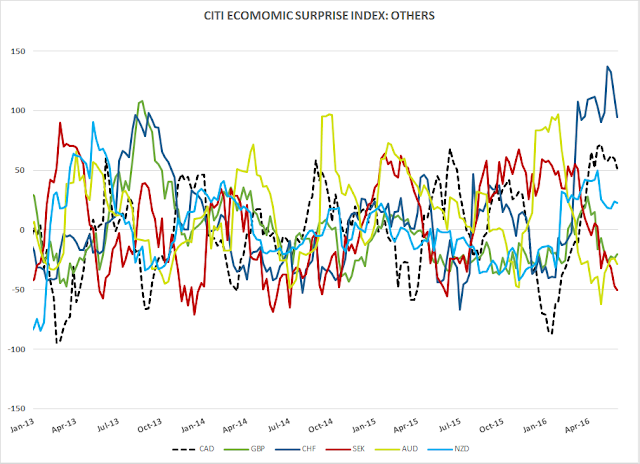 Macro Man decided to pull together charts on two measures of economic momentum: the OECD leading indicators and the Citi economic surprise indices. While each has their flaws, as a shorthand way of gauging how things are going each also has their uses. 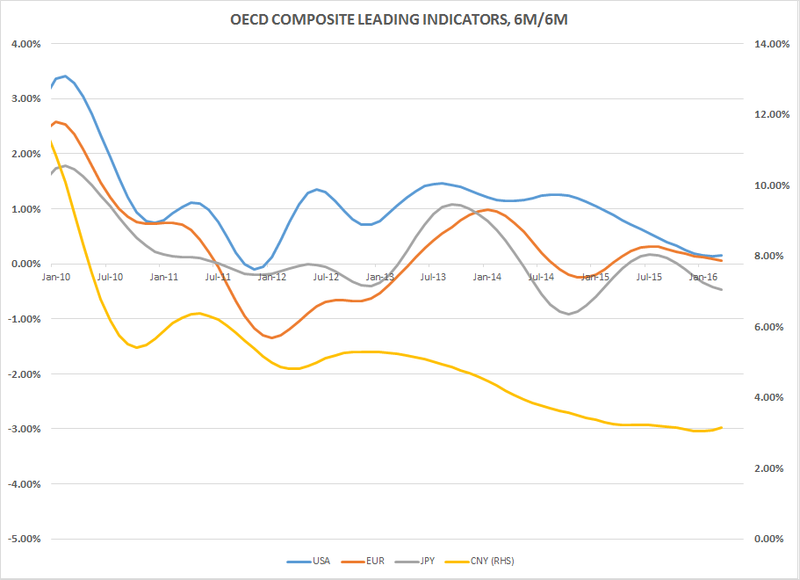 The OECD leading indicator doesn't really tell you that much that you didn't know about G4 economies. The growth impetus has, for the most part, been pretty anemic, the solid GDPNow forecast for Q2 US growth notwithstanding. 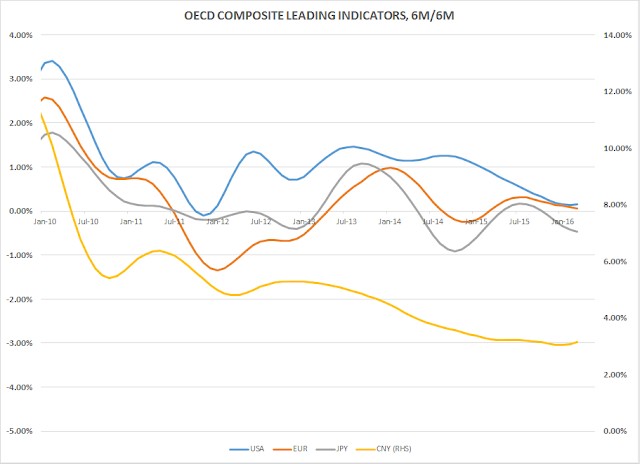 It's interesting to see little vigor in the Eurozone growth momentum (a bit more on this below) despite the reams of easing that the ECB has engaged in. 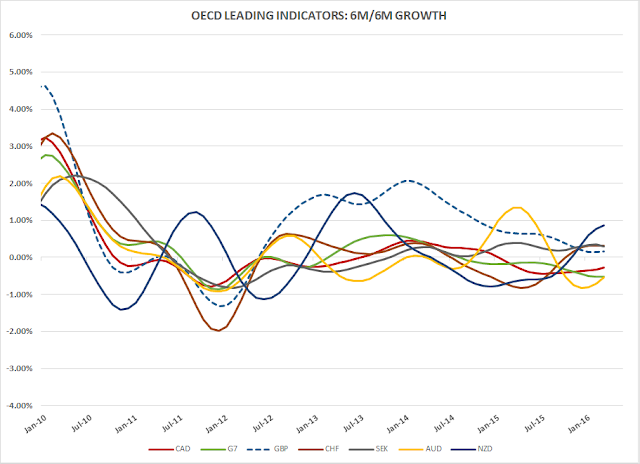 There's a bit more dispersion in the trajectories of smaller countries, though one can justifiably ask questions about the accuracy of some of the indicators. After all, momentum in Australia is shown to be bottom-of-the-barrel; while it's true that the RBA has cut rates recently, that was an inflation thing. You really wouldn't expect a country with such weak growth momentum to be posting Q/Q non annualized growth of 1.1% as the Aussies did in Q1. Still, the divergence between the AUD and NZD indicators has generally coincided with weakness in AUD/NZD, so maybe there is some use there. 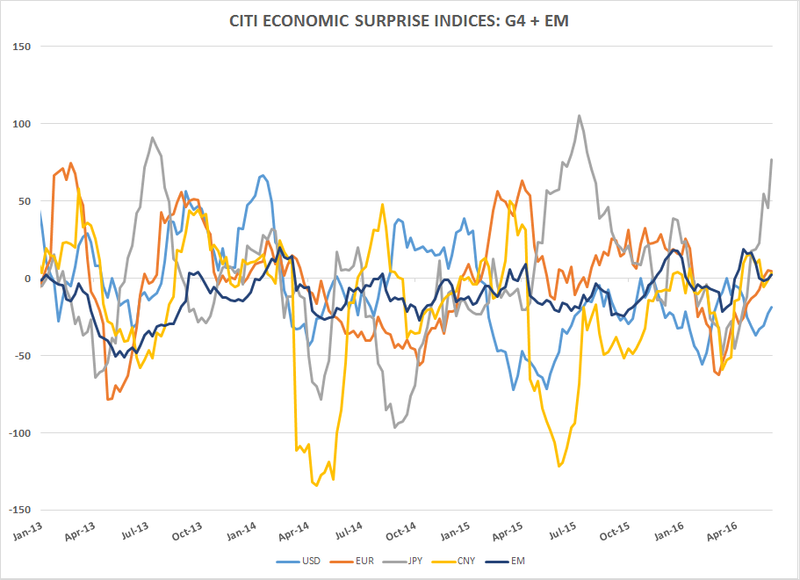 Japan is the notable outlier in terms of G4 economic surprise. What are we to make of this, given that the burst higher has coincided with a general strengthening of the yen? An obvious conclusion might be that the Japanese economy is a bit more resilient than commonly thought to the recent yen appreciation; given that the JPY is still on the weak side of fair value against many currencies, such a conclusion might make some sense. As for the rest, well, it's a bit of a dog's breakfast there. 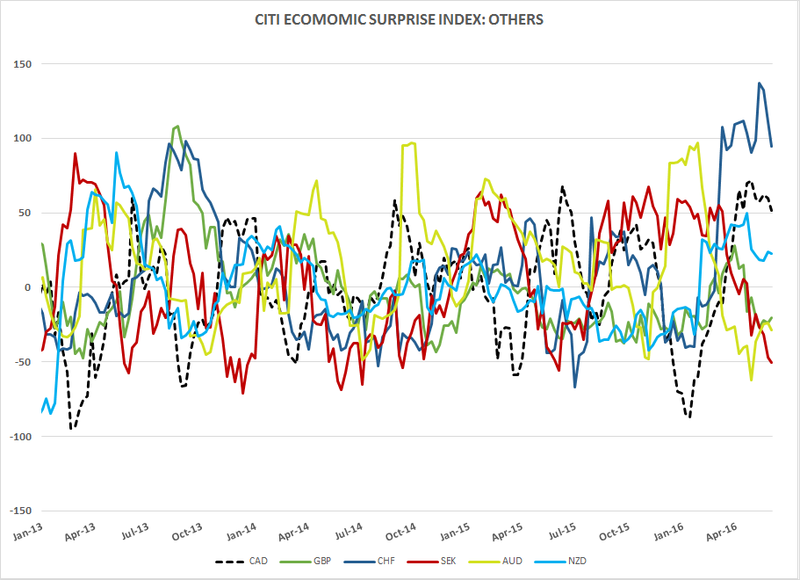 There's been a notable divergence in the CHF and SEK ESI's, but you wouldn't really know it from looking at FX chart. This in turn serves as a useful reminded that these broad scans are necessarily shallow, and that a lot of the observed "signals" may just prove to be noise. 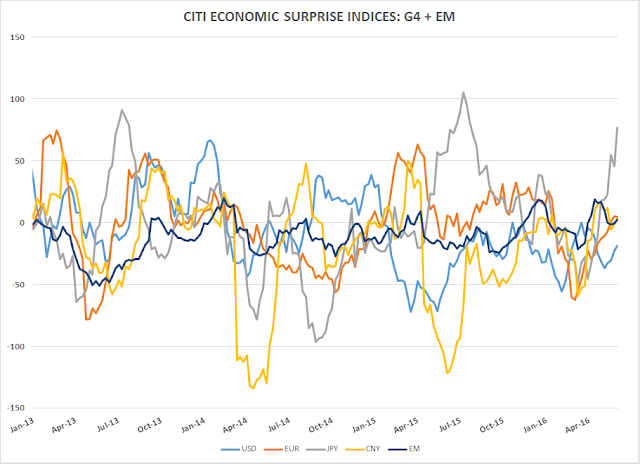 This especially holds for smaller country surprise indices where the forecast samples may not be particularly good. Returning to Europe for a moment, one interesting development yesterday came with the release of the monetary data. While MFI lending to non financial corporations continued to improve, the growth rate of lending to households declined for the first time since February 2015. Perhaps more worryingly, despite the new ECB measures M3 growth declined 4.6%, its lowest level since February of last year (coincidentally enough). Although it has seemed for some time that there was room for upside surprise to the EZ growth figures (and thus, potentially, bond yields) nothing presented here suggests that such an outcome is more likely than further disappointment. Last week's Bobl recommendation is a couple of bps offside, but that's why it's important to use stops for this type of trade; it keeps the fretting to a minimum. Governments in the six-nation Gulf Cooperation Council, which includes the two-biggest Arab economies of Saudi Arabia and the United Arab Emirates, are turning to public markets after the plunge in oil prices punched holes in their budgets. Qatar last week attracted $23 billion in orders for its $9 billion sale, the biggest-ever from the Middle East. Abu Dhabi raised $5 billion from the sale of five- and 10-year securities in April, while Dubai is also said to be preparing an international bond sale this year. Neutralising UST holdings, neg carry, budget holes..take your pick. My Spidey senses are tingling. The oil moves are going to play out for some time yet. And then there's Venezuela...how long until the US makes a move there with or without the UN. I sense a summer of discontent (or winter which has finally arrived down here in the antipodes). "Hard to say at this point which way it will be, though if recent Brexit polls showing Leave picking up steam are accurate, it might not be hard to identify the catalyst..."
We wondered whether the January Gap and Crap might repeat. Looking at the yen crosses this morning, there's a good chance that we were correct. Is this just another f-in' dip for the youngsters to buy eagerly? Watch this space.... (actually watch USDCNY and USDJPY). 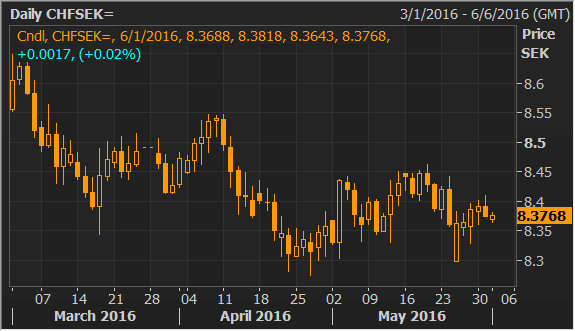 This also might be the day where we find out what the funding currency has been for the leveraged crude rally....? LB: maybe. Color me deeply skeptical about a hike in June or July though. If there isn't going to be one, a dollar correction should kick in around now. I wonder whether a combination of dollar correction and no rate hike might excite SPX back to the top end of the range 2120. I am a bit anxious about holding an SPX short here. Long gold I am still holding with a stop around 1190. I feel more comfortable that this is more imminent than the short SPX. No rate hike would likely lead to dollar correction which would suggest gold to 1300 and oil to $55-60 before a final rollover in commodities/SPX/risk. Booger/Left - one thing we all seem to agree on (somewhat) is the idea that if the dollar were to weaken substantially from here the majority of it would be vs the Yen - all dollar weakening is not created equal - if crude rallies to 55-60 on a headline weakening driven by the risk averse Yen rally, that would be an insane example of whistling past the graveyard, but I'm not one to suggest crude isn't capable of doing precisely that and carrying spoos to new highs in the process as you suggested, especially for an environment where APPL is struggling to hold 100. I actually like the gold idea a lot for your scenario where the fed is seen disappearing into the restroom followed by loud retching sounds - maybe long gold vs oil even perhaps. the money on the sidelines argument i never get- corporates issue shares and at all times someone has to hold them- if i withdraw money from my fund then someone has to buy those shares- cash doesn't just leave. also given dismal performance by money managers a lot of this cash might be going to tracker funds- if one looks at household wealth in equities or fund cash positions they tell similar story- equites are always owned so i never get this argument that no one's got it! really???!!! @anon 5:23 Ive learnt to cut the 'cash on the sidelines' crowd some slack - when you are talking to the average Joe Q. Long on TV, its a lot easier to say 'plenty of cash on the sidelines' than to argue 'high velocity relatively price agnostic capital with a short time frame has temporarily transferred its erstwhile long position to corporate treasuries and retail investors'. Jokes aside - yes you are absolutely correct - for all the headlines garnered by perms-bulls and bears, major equity moves have always been about the marginal actions of perms-longs tweaking their allocation between 95% and 98%, and the prices are determined by the risk sentiment prevalent at the time of the transaction. The fact that the re-allocation has been enough to guarantee 400-500 point annual ranges in spoos for the past 15 years should be self evident. MM, on CHFSEK, Im not an FX guy, but just wondering how many ppl play that cross? Swissy seems strong vs Euro, perhaps bc of the gold/hard money association, though I will give you SEKEUR isnt doing much either. re anon 5:23, I think historically, long term investors are served well looking for reasons NOT to own equities vs when to buy them. Not a jbtfd guy here just pointing out LT returns for (US) equities trump most asset classes, so the objective is to own them most of the time and only avoid when it is glaringly obvious. Valuation is high but not a 2001 situation and the fundamentals while bumping along the bottom, arent declining which I guess is good enough. Q2 earnings I suspect will be big as analyst are now expecting #'s to improve. Japanese bonds. Can I short them yet? Widowmaker and all that, but - positive carry. Wish I were joking. Anyway, thoughts? 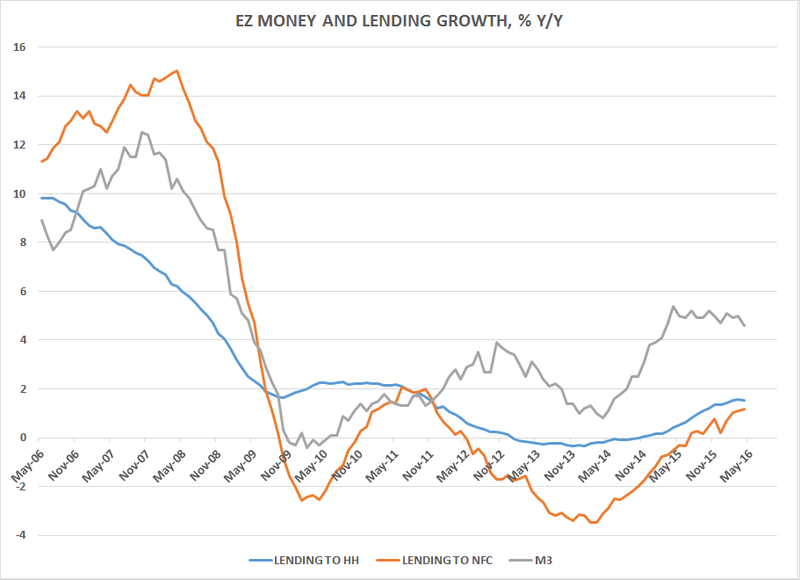 There is a reasonably well-defined correlation between domestic savings rates and domestic indebtedness among emerging market (EM) economies (see Chart 2). For instance, China and Singapore have the highest domestic indebtedness, which mirrors their very high gross domestic savings rates. By the same token, low-saving nations such as South Africa, Turkey, and Latin American economies have significantly lower debt levels. @abee - this article is well thought out, but kind of misses the whole point - whether debt is benign or not really ultimately depends on what you do with it - if you use 1 trillion dollars on elementary school education in india and bangladesh, over a 30 year period there are ridiculously massive returns - if you distribute it among the bottom 2% of the population in developed countries and they rush out and buy iPhones with the money, thats not as great of an investment but at-least juices AD temporarily - roads, bridges, broadband have varying merit too - the problem occurs when you take the excess debt and create malinvestment in that you keep creating overcapacity and/or it finds its way into asset markets such that you bring forward future returns, thats when there is an issue. The debate on debt should therefore focus exclusively on the use and not the magnitude, or as the article painstakingly focuses on, the source of funding - I'd argue the latter is irrelevant in a global market anyway - case in point, note swiftie, who I surmise is not running a japanese corporation, and does not have a day job as the japanese FM, is considering shorting JGB's and synthetically borrowing. Well saidone washed. But I think it's a good article for those kyle bass traders / jGB shorting crowd to consider. Regarding uses of debt I would think it's not always easy to pin point exactly where money is flowing to scientifically though a lot easier anecdotally. Also a great argument I read from Morgan Stanley once was that it's not the amount but the pace of increase that is most important. The government was happy to use the high of the quarter in their budget estimates though, so everything is ok, as you were.